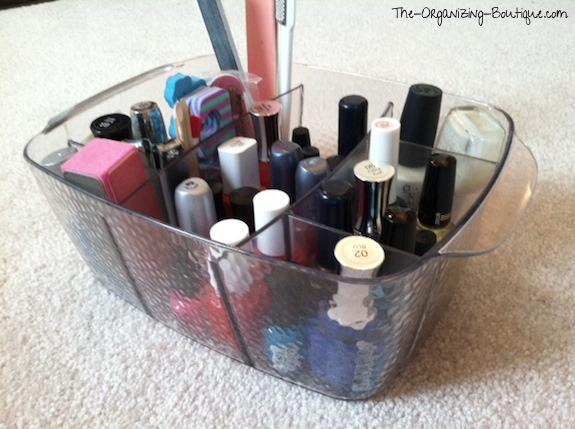 Trying to find a nail polish organizer? 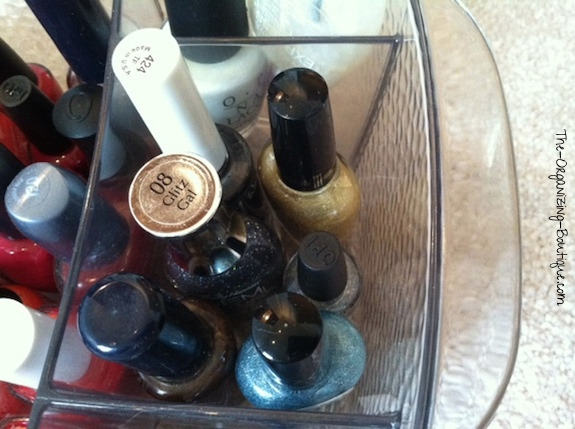 This is a question I am asked quite a bit, so I thought I'd give you a "tour" of how I organize my own nail polishes. 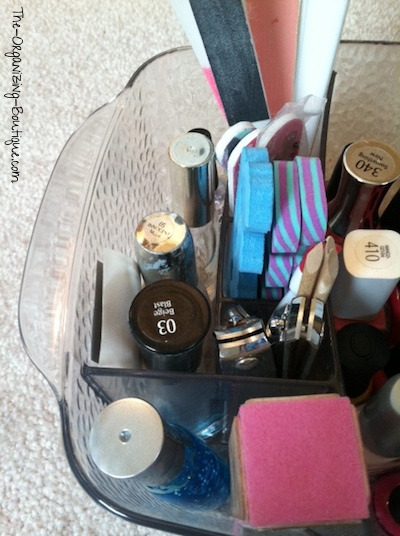 Without further ado, this is the nail polish holder a professional organizer (that's me!) uses to keep her items neat and handy. Enjoy! This is my nail polish storage solution (InterDesign Cosmetic Organizer). I love it, because I can identify and get to everything very easily. As you can see, it's not a large nail polish storage container and I only keep what will fit inside of it. This keeps me accountable, so I don't buy nail polish or manicure items I really don't need. Here is a view from above, so you can see the actual dividers and how everything fits inside. Each compartment holds a different category of things. On the right side are 3 compartments that hold different color groupings. In the front are my blue polishes, in the middle are the sparkly and the dark ones, and in the back are the whites. This is a close up of the middle section containing the glitter and dark nail polishes. Since the middle section of the entire nail polish container is the largest, it stores the category of polish that I have the most of - variations of red. As you can see, I have my pinks, oranges, reds and maroons there. On the left side of the nail polish holder are all of my tools and manicure items. 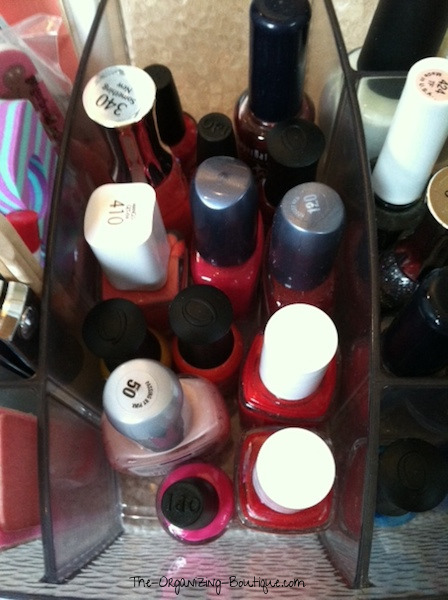 There is the long compartment on the very left that holds my clear nail polish or top coats. To the right of that are 3 tiny compartments that are perfect for the skinnier, taller items like the nail files. In front is my nail strengthener gel and my 4-sided nail filer (the pink square thing has a different type of nail file on each side of it). So there you have it! That is the full tour of my nail polish organizer. 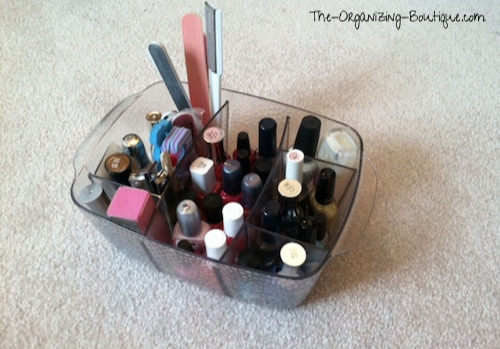 I hope this helps you in your nail polish organizing endeavors. 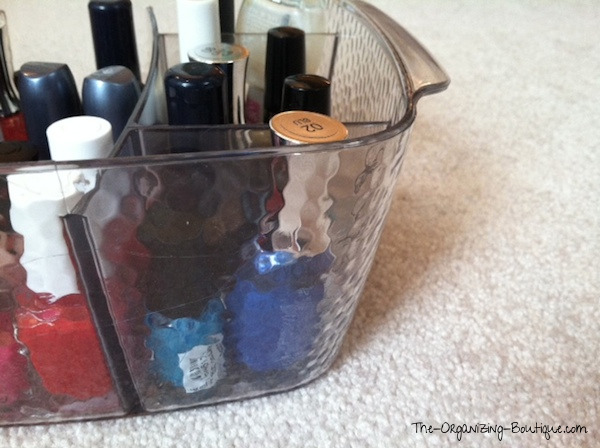 If you're interested in learning how to organize nail polish (i.e. 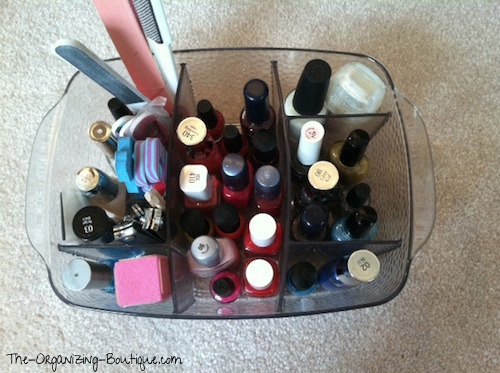 the exact process) and see some awesome nail polish storage solutions (i.e. nail polish rack, nail polish case, nail polish organizer), then click here!